Unlike many of her peers, Vera was not born on a ranch, but her athletic ability made her a natural when she discovered the rodeo. 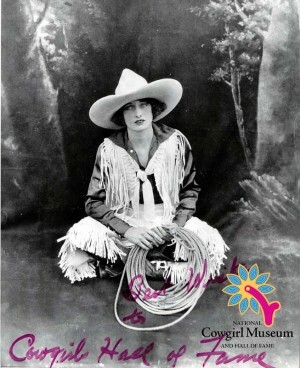 Beginning her career as an impromptu relay rider, she soon took up trick riding, bronc and bull riding and Roman racing, winning at all events. A celebrated rider, Vera’s most famous trick was the under-the-belly crawl at full speed. Touring with rodeo shows, she performed in Canada, Europe, Asia and the United States.